The PowerLine AV500 Wireless N Mini Starter Kit allows you to set up and start enjoying the convenience and reliability of a high-speed wireless or Powerline network in your home right away. The DHP-W311AV features the DHP-W310AV PowerLine AV500 Wireless N Mini Extender and the DHP-308AV PowerLine AV500 Mini Adapter, giving you everything you need to create a high-speed Powerline network in your home. The DHP-W311AV features a PowerLine1 network connection, compliant with the HomePlug AV standard, that uses your existing home electrical wiring to create or extend your home network. To set up a PowerLine network, just connect the DHP-W310AV into one power outlet and the DHP-308AV into another power outlet in another location in your home. The DHP-W311AV PowerLine AV500 Wireless N Mini Starter Kit is capable of high speeds of over 200 Mbps for Powerline, making it faster than regular PowerLine AV products, enabling you to stream movies, download large files, and enjoy a fast Internet connection for Web surfing. The DHP-W310 and DHP-308AV also support Quality of Service features that ensure faster multimedia traffic by prioritising multimedia data over non-multimedia data. The DHP-W311AV features 128-bit AES Data Encryption for PLC PowerLine to ensure a secure PowerLine network connection. The DHP-W310AV and DHP-308AV both feature a one-touch button to easily set up security. 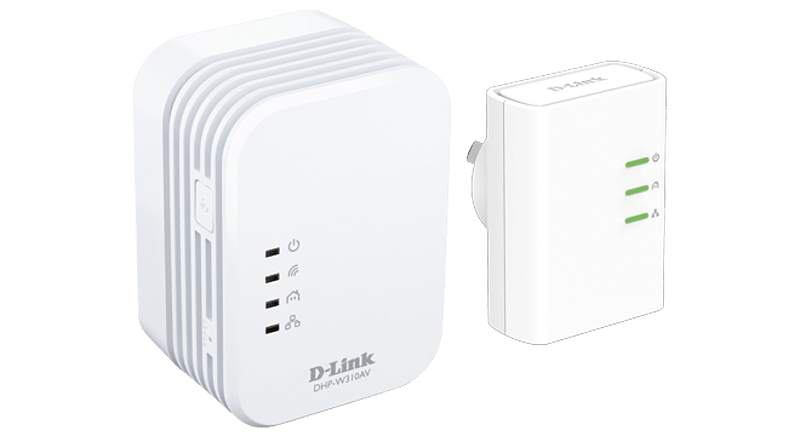 The DHP-W310AV has a Common Connect button that you press to set up either Wi-Fi Protected Setup (WPS) for your wireless connection or a secure Powerline connection, while the DHP-308AV features a Simple Connect button for setting up PowerLine encryption.